I bought “Vegan Gourmet” almost a year ago and although I’d read through it a few times and thought it looked OK I hadn’t had the urge to try anything. This week’s vegetable box turned up fennel, broccoli and carrots – all of which were included in this recipe. It looks a bit like a dull stew but it’s got cayenne, cinnamon, coriander, cumin and turmeric in which all gave it a nice level of spice, and dried apricots to give it sweetness. I don’t normally go for savoury dishes with fruit in but I was feeling adventurous! The finished dish was very tasty but something wasn’t quite right and when I relooked at the recipe there was no salt in it at all. I think she may be cooking for low sodium diets but I love my salt so I had to give it a boost at the end with plenty of extra. From reading the recipe I thought the rice was an intrinsic part of the dish but it was actually only an accompaniment and I’d probably use bulgar or couscous instead another time. I also have a grip about the title of the dish because it certainly isn’t a stir fry. It sounds like a lot of complaints but I warmly welcome recipes using this amount of vegetables, especially the never ending vegetable box carrots, so I would make it again! 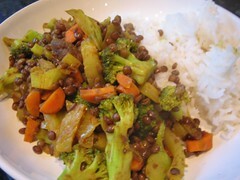 This entry was posted in Vegan gourmet by efcliz. Bookmark the permalink.